As smartphone adoption continues to increase around the world, cross-platform messaging has never been of higher importance. The most popular cross-platform instant messenger remains to be WhatsApp, and for good reason. WhatsApp is a fantastic application, with seamless integration for iOS, Android, Windows Phone and other devices. With that being said, one thing which WhatsApp continues to disappoint with, is support for any other iOS device other than the iPhone. Users of the iPod touch or iPad cannot currently download and activate the application, and will be presented with an ugly error if they try. There is a way of getting WhatsApp to become fully functional on both Apple’s tablet, the iPad, and their iPod touch range. And yes, it works even on iOS 8.4, the latest jailbreakable firmware. Before we dive right in there are a few simple prerequisites needed to complete the process. A jailbroken iPad or iPod touch running iOS 7.x or iOS 8.x. If your device is not jailbroken, check out info on how to jailbreak here: Jailbreak iOS 8.4 With TaiG / PP On iPhone 6, 6 Plus, 5s, More [Updated]. A computer running either Windows or OS X. The latest stable version of iTunes installed. A functioning file and app management tool. In this guide, we’ll be using iFunbox. Step 1: Launch Cydia on the jailbroken iPad or iPod and navigate to the Search page within the app. Step 2: Search for a tweak by the name of “WhatsPad” and access its dedicated tweak page. Step 3: Install the “WhatsPad” tweak via the usual mechanisms in Cydia. This is a free-of-charge installation from the BigBoss repository. Step 4: Download iFunbox on your Mac or Windows PC by pointing your Web browser to i-funbox.com. Step 5: Launch iTunes on the computer and select the “App Store” link from the top navigation bar, search for the official WhatsApp application, and download it on your computer. Step 6: Now plug the jailbroken iPad or iPod touch into the computer, and launch iFunbox. Step 7: Click the Install App icon in iFunbox, and navigate to the location where the WhatsApp IPA file was downloaded to. On Windows, the IPA file should typically be found in Music > iTunes > iTunes Media > Mobile Applications. On Mac OS X this would be Macintosh HD > Users > [your username] > Music > iTunes > iTunes Media > Mobile Applications. Step 8: Select the downloaded WhatsApp IPA file and then click on “Open“. This will invoke an installation process to the connected jailbroken iOS device. Step 9: When the process is complete, WhatsApp will be installed, and now in conjunction with the WhatsPad Cydia tweak, will offer a fully functioning WhatsApp experience on the iPad or iPod touch. Step 10: For activation, you can simply use the phone number of an active SIM that you may have in your phone. 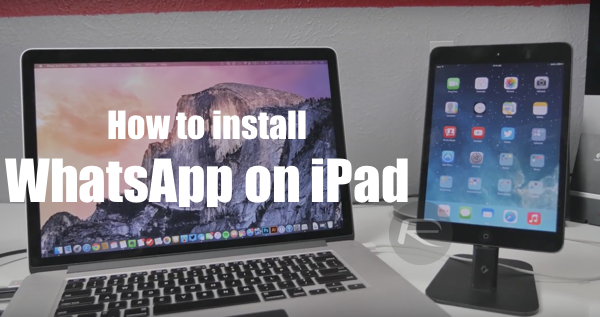 So there you have it, a simple, time effective way of getting the official WhatsApp Messenger app running on the iPad or iPod touch. The user-interface isn’t exactly finely tuned for the large display of Apple’s tablet, but it’s undoubtedly better than nothing. If you want to run the app in native iPad resolution, you can try jailbreak tweaks such as ForceGoodFit, FullForce or RetinaPad. It says on ifunox… Itunes install is not supported wtf??? Does Whatspad along with WhatsApp 2.11.8 support the TaiG Jailbreak? not clear if i need only wifi or is necessary cellular version ? Many thanks in advance people ! Make sure you disable auto update for WhatsApp in iPad settings…..
so the whats app in iphone would not be affected …?? and what about the iphone does it affect iphone ? I tried using Whatsapp but yes, it indeed got installed but even after following all the steps given above i’m resulted with nothing but an error saying that my ipod touch is currently not supportive to this app. Its Fake, this guy has jailbroken his devices, u cant install without APPSYNC and you have to install whatspadd to enable whatsapp on your ipad, i have done it with my ipad jailbroken and not jailb and thats the difference. I have a non jailbroken iPod touch 4g and a 5g. I also have a windows 7 pc. I am able to borrow a iPhone 5s with the latest version of IOS 8….. What should I do best? the problem is each time u do backup or sync with itunes it will delete this whatsapp, any other ways so itunes wont delete it? I’m using iOS 8.4 on iPad Air and it works.